The UN Security Council unanimously passed new, US-drafted sanctions that will restrict oil supplies. The North has defended its missile and nuclear weapons programmes as measures for self-defense against "hostile" US policies towards Pyongyang. NORTH KOREA HAS slammed fresh UN sanctions imposed over its missile tests as an “act of war”, its first response to the latest diplomatic move to punish Pyongyang’s ever-accelerating weapons drive. Tension has been high on the flashpoint peninsula as the isolated but nuclear-armed regime has staged a series of atomic and intercontinental ballistic missile (ICBM) tests – most recently on 29 November. The latest launch of the Hwasong-15 ICBM, seen capable of hitting all major US cities, further heightened global alarm over the rapid advance in the country’s weapons technology. “We fully reject the latest UN sanctions… as a violent breach of our republic’s sovereignty and an act of war that destroys the peace and stability of the Korean peninsula and a wider region,” Pyongyang’s foreign ministry said in a statement carried by the state-run KCNA news agency. 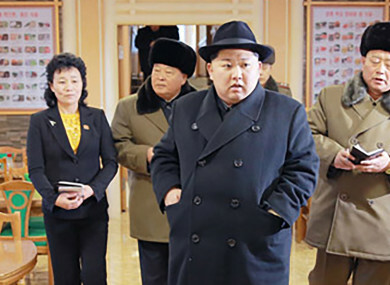 Pyongyang’s bellicose reply came a day after the UN Security Council unanimously passed new, US-drafted sanctions that will restrict oil supplies vital for the impoverished state. The third raft of sanctions imposed on the North this year, sparked by last month’s ICBM test, also received the backing of China — the North’s sole major ally and economic lifeline. The sanctions also order the repatriation of North Korean workers sent abroad to earn much needed revenue for Kim Jong-Un’s regime. The country’s weapons programmes have made significant progress since Kim took power in 2011. The North has defended its missile and nuclear weapons programmes as measures for self-defense against “hostile” US policies towards Pyongyang. And a defiant Pyongyang vowed on Sunday that the country would continue its weapons push “more vigorously” to “form a balance of power with the US”. “If you think that those toothless ‘sanctions’ could stop the victorious march of our people who have… achieved the historic goal of building the national nuclear weapons, there would not be a bigger mistake than that,” the foreign ministry said. “The US and its puppet followers should never forget the newly-upgraded status of our nation as a nation that could pose a real nuclear threat to the US mainland,” it added. The North claimed last month that its ICBM could deliver a “super-large heavy (nuclear) warhead” to anywhere in the US mainland. But experts believe that Pyongyang has yet to develop the advanced technology to allow its rockets to survive re-entry into the earth’s atmosphere. Trump and Kim have traded threats of war and personal insults against each other in recent months, prompting fears of another conflict on the peninsula once devastated by the 1950-53 Korean War. The resolution bans the supply of nearly 75 percent of refined oil products to the North, puts a cap on crude deliveries and orders all North Koreans working abroad to be sent back by the end of 2019. It also bans sales of all industrial machinery, trucks, iron, steel and other metals to the North and added 15 Pyongyang officials to the UN sanctions blacklist for global visa ban and assets freeze. Email “North Korea says new UN sanctions are an 'act of war'”. Feedback on “North Korea says new UN sanctions are an 'act of war'”.